For the second straight year, the festival took place on a weekend without a bank holiday to extend it, and without the stimulating effect of the 20th anniversary, attendance was slightly down. 1,700 memberships, that's -12% compared to 2008. Supporting membership has progressed to 8% of total memberships, as have the pre-festival purchasing option (9%) as well as the reduced price memberships (21%). The lower number of members saw a proportionately higher number of films. Indeed, there were 6,601 admission tickets counted, which is just 3% lower than the previous year. The average number of entries per member reached 3.9 (as opposed to 3.6 in 2008). The selection was comprised of 73 films from 18 different countries. No record-breaking screenings in 2009, but satisfying scores for Drool (685 admissions), the collection of shorts called Nos courts préférés (567), Hannah Free (541) and for opening night, with the lively, moving performance by Melissa Laveaux, followed by the projection of Ghosted (450), heralding the return of Monika Treut. As usual, the auditorium in the Halle-St-Pierre was full to bursting for a number of screenings: Mieux vaut tard que jamais (108), Sortir du Nkuta (107), Paroles africaines (94), U People (95) and Histoires que personne ne raconte... (95), as well as for the collections of shorts entitled Il était une fois... (103) and Nos courts préférés (87). Anne Delabre's conference on Le cinéma français et l'homosexualité and the two discussions, Bagdam fête ses 20 ans and Black Feminism, were well-attended, as were the Q&As with the directors who were present at several screenings. On the other hand, the discussion / workshop Sexualité et Plaisir scheduled for Monday afternoon at the Trianon had to be cancelled, as the facilitator had an unexpected problem. Is it a side effect of the financial crisis? Fewer filmmakers attended the festival this year. The F-SPACE 4 exhibit inaugurated its new setting, a white tent in the conservatory in which festival-goers had a chance to see Cecile Proust's video-manifestos from the Femmeuses series, Evelyn Stermitz's video installation, Rose is a rose and, on Sunday, Astrid Breel's performance piece, Own Me. The other two artistes, Sophie Boulet and Elena Garcia-Oliveros, took over the public toilets for their on-site installations. Overall, the end-of-year accounts are slightly in the red (1,647 €, i.e. 2% of the total budget). Still, the festival itself nearly broke even. Despite lower intake due to lower attendance figures, budgetary savings were made by the programming commission, in printing documents and in organising the exhibit. 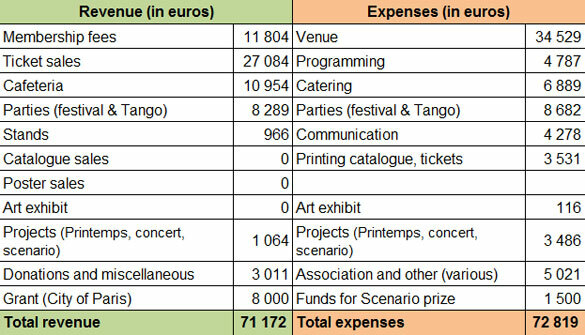 In addition to its priceless contribution to the festival's overall atmosphere, the cafeteria always generates income that contributes to the costs of the festival, even though it was slightly lower this year. The subsidy from the City of Paris, in the name of the Observatory of Male/Female Equality, is unchanged (8,000 €). The only exception, the dance party on 31 October at the Bus Palladium which, despite the lower costs negotiated by the party committee, didn't attract enough partygoers. But the 344 attendees were true maniacs on the floor! The evening's deficit, though lower than 2008's, was not offset by the surplus from Cineffable's three "Thés au Gazon" at the Tango over the course of the year. In addition, with 115 entries for 3 screenings, Le Printemps de Cineffable, the new open-to-all event on 7 June, did not manage to cover costs. The time spent in finding an appropriate and affordable place to hold the event delayed communication about this new rendezvous. The disappointing outcome (-€1,230) accentuated the slight deficit (€392) generated by the parties. For 2010, and despite the incertitude that still hangs over the space (will the renovation work at the Trianon be done in time? ), the festival crew is already hard at work concocting an attractive programme, with a focus on activism, in honour of 40 years of feminism – but that's not all – in both the films and the debates. We will once again request a subsidy, adapting it, if need be, to the possibility of increased demands on our finances. In the meantime, your presence at the Cineffable Spring and the dance parties at the Tango contribute to the festival's continuation.